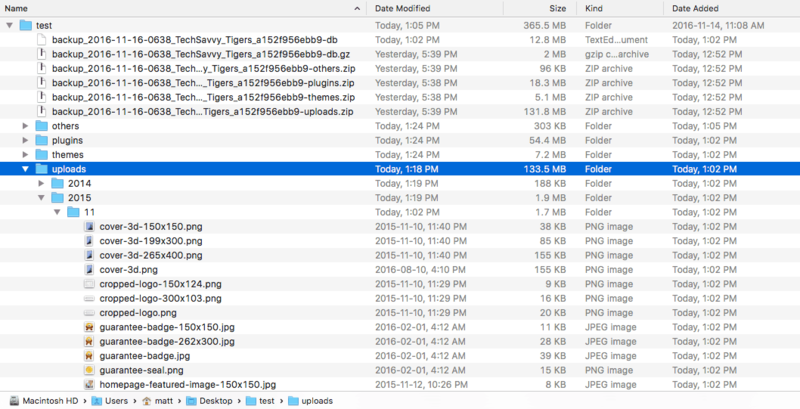 UpdraftPlus backs up your WordPress site’s database, theme files, plugin files, and your uploaded media files (such as images and PDFs). In other words, it backs up all the important bits of your site. It stores these backups in Zip files to save space, then uploads those Zip files to a remote destination — such as your Dropbox, your Google Drive, or your own FTP server — for safekeeping. It can also email the backup Zip files to your email address, although this option is only worth using if your site is very small, or if you’re just backing up your WordPress database (which is much smaller than the other parts of your WordPress site). 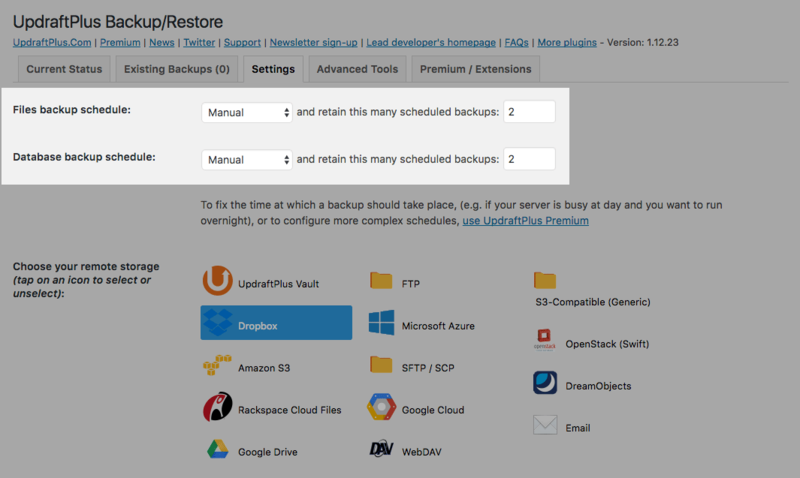 You can set up a backup schedule, so that UpdraftPlus automatically backs up your site. You can choose how often to run backups — from as often as every four hours, to as rarely as once a month. UpdraftPlus is pretty reliable. If a backup fails, it automatically tries again until it backs up successfully. It also splits large backups into multiple backup files, which helps to reduce the load on your web server and makes the backups easier to download. 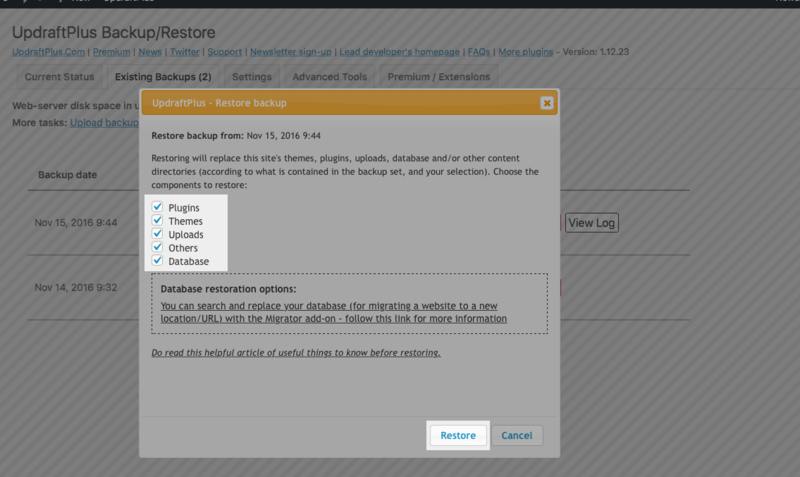 Finally, it’s really easy to restore your site from a backup just by clicking a couple of buttons. 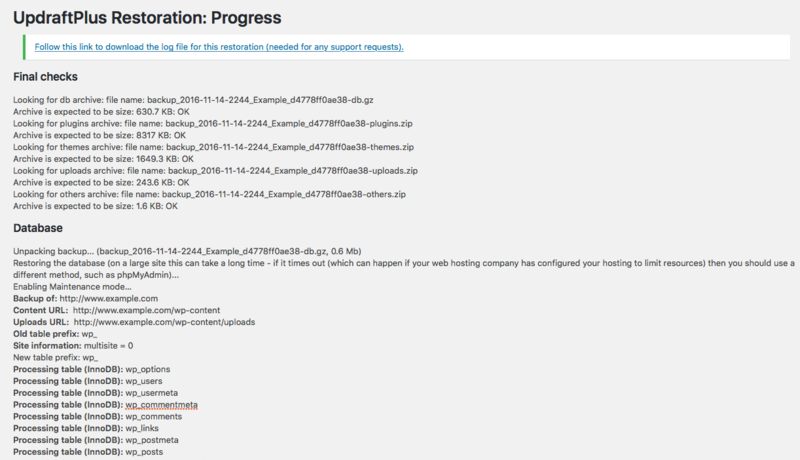 UpdraftPlus restores your site’s database and files automatically. Ready to install UpdraftPlus and start backing up your site? Let’s go! Visit your WordPress admin URL, then enter your admin username and password and click Log In. Search for the UpdraftPlus plugin. In the left-hand admin menu, choose Plugins > Add New. In the Search Plugins box at the top right of the page, type UpdraftPlus and press Return. To install UpdraftPlus, search for it in the Search Plugins box, then click its Install Now button. After a short while, the Install Now button should change to say Activate. Click the button to activate the plugin. In a few seconds, you should see the message Plugin activated appear at the top of the page. You’ve now installed UpdraftPlus. Nice job! 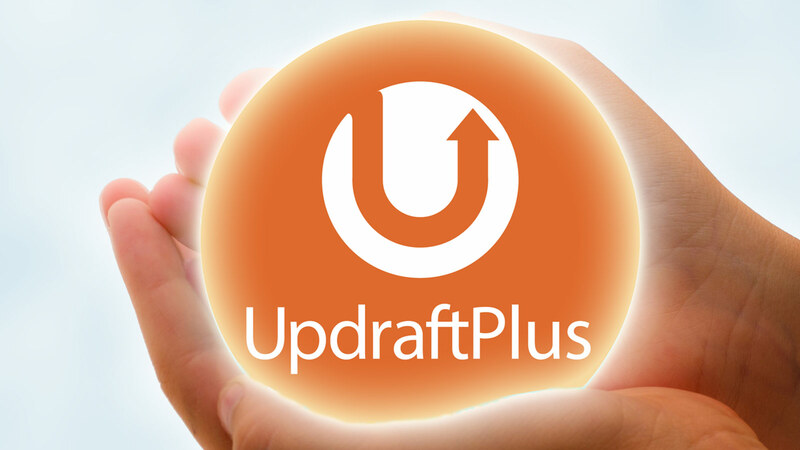 Visit the UpdraftPlus admin page. 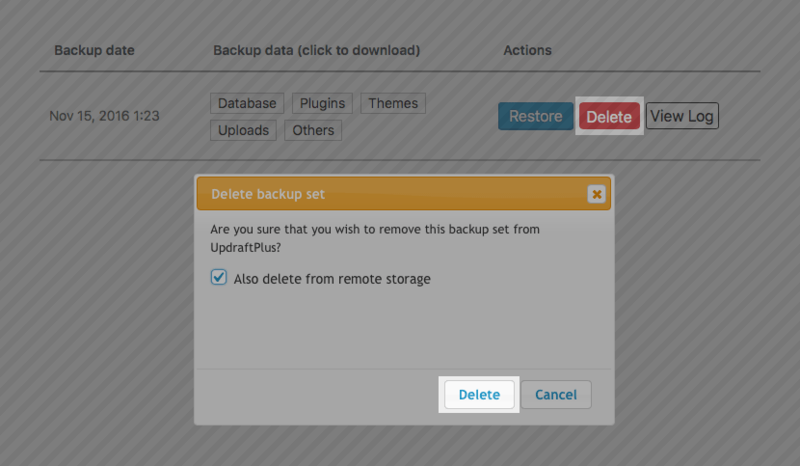 Choose Settings > UpdraftPlus Backups to visit the UpdraftPlus admin page. 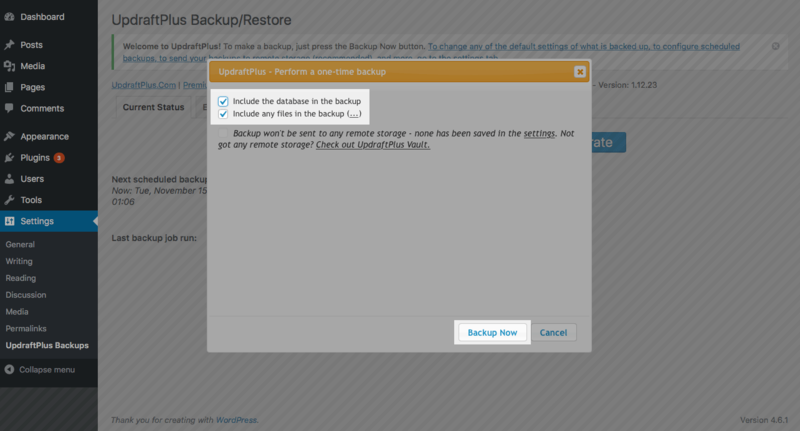 Make sure everything will be included in the backup, then click Backup Now to make the backup. After a short while, your first UpdraftPlus backup will be done. You should see your new backup in the Existing Backups tab. Download the database backup file. Click the Database button, then click the Download to your computer button to save the database backup on your computer. Download the other backup files. Click the Plugins, Themes, Uploads and Others buttons in turn. After you’ve clicked each button, click the Download to your computer button that appears, as you did in the previous step. To delete the backup, click the red Delete button, then click Delete in the pop-up box. 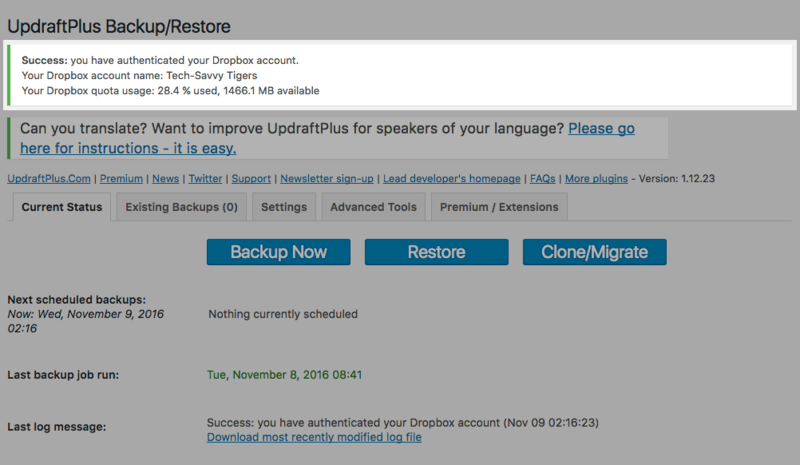 Once UpdraftPlus has deleted your backup, click Close to close the confirmation box. You’re doing great! You’ve installed UpdraftPlus and you’ve made a manual backup, which you’ve downloaded to your computer. You now have a full backup of your site’s database and files stored on your computer, in case anything goes wrong in the future. As we saw in the last step, it’s not a good idea to store backups on your web server, so let’s tell UpdraftPlus to store the backups in your Dropbox account instead. If you don’t have a Dropbox account, you can sign up for free and get 2 GB of space, which should be enough to back up most sites. To sign up, just visit dropbox.com and follow the instructions. Bring up the UpdraftPlus Settings tab. Click the Settings tab to bring up the UpdraftPlus settings. Select the Dropbox remote storage option. Click the Dropbox icon, then scroll down and click Save Changes. 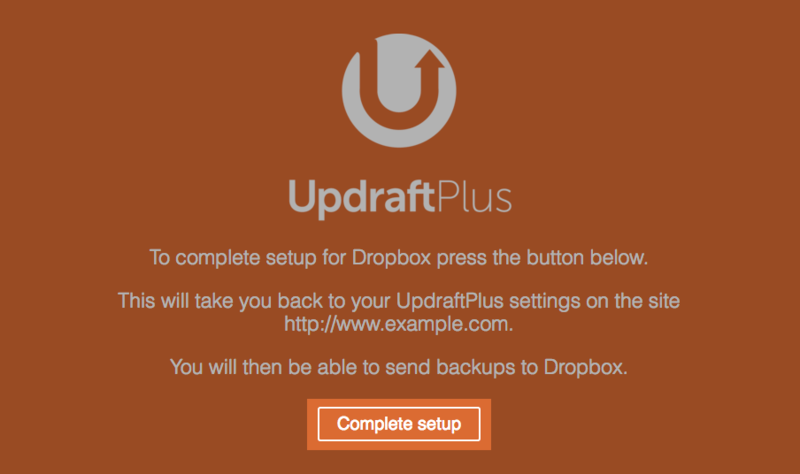 Click the blue link to start the process of connecting UpdraftPlus to your Dropbox. Allow UpdraftPlus to connect to your Dropbox account. Click Allow to let UpdraftPlus access your Dropbox. 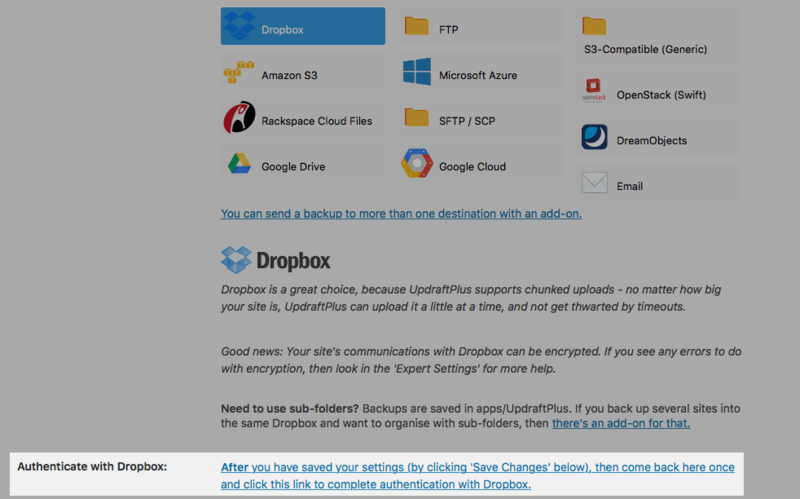 Click Complete setup to finish linking UpdraftPlus with Dropbox. Once Dropbox is linked, you’ll see a “Success” message appear in your UpdraftPlus admin. Good work! 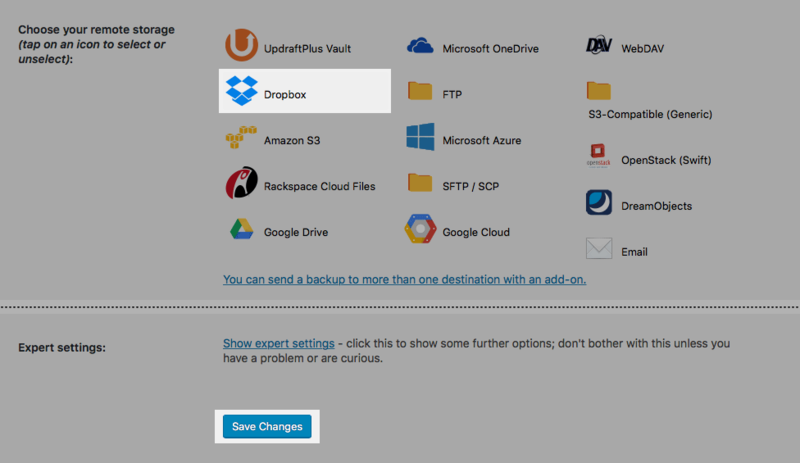 UpdraftPlus will now store all your backups in your Dropbox account. You’ll find them inside a folder called UpdraftPlus, which is inside the Apps folder in your Dropbox. Your site changes every day as you add new content, install and tweak plugins and themes, and get comments on your blog posts. 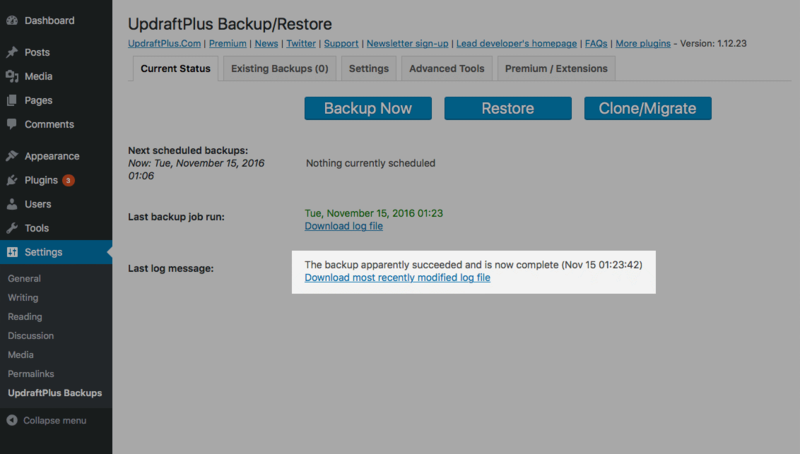 So it’s a great idea to set up a backup schedule, so that UpdraftPlus regularly backs up your site for you. These settings let you set up a schedule so that backups happen automatically. Your WordPress database (which contains your pages, posts, widget settings, and other settings and content). Click the Manual button next to Files backup schedule, then choose how often you’d like to back up your files. Enter the number of backups you’d like UpdraftPlus to keep. Repeat this process for the Database backup schedule. Then click Save Changes at the bottom of the page. What schedule should you use? If you don’t update your site much then Weekly is probably fine. If you update more often, or you have an online store, then you’ll probably want to set it to Daily or even Every 4 hours. Bear in mind that it’s a good idea to keep several weeks’ worth of backups in case you need to roll your site back. I like to keep at least three months’ worth. So if you set your schedule to Weekly then I’d recommend keeping at least 15 backups or so. If you’re (a) backing up daily, (b) keeping several weeks of backups, and (c) running anything other than a tiny site, then you’ll start to use up a lot of storage space in your Dropbox. The stuff stored in your Database backup is more important. If you were to lose your Files backup, you could probably reinstall your theme and plugins, and recover or recreate at least some of your uploaded images from your computer. However, the Database backup contains all your pages, posts, comments, settings, and other content, which would probably be harder to recreate if you lost the backup. Your database is updated more frequently than your files. You might upload an image or two every few days, and maybe update your theme and plugins once a week. However, your database changes whenever you post or update a page or blog post; whenever someone leaves a comment; and — in the case of an online store — whenever anyone makes a purchase. So it’s much more important to have frequent backups of your database. Finally, the Database backup is usually much, much smaller than the Files backup. So it’s OK to back it up every day. If you set up different schedules for your database and files like this, you’ll be able to store a lot more backups before you run out of Dropbox space. In the UpdraftPlus admin page, click the Settings tab near the top. Select this checkbox to turn on email reporting. Now, every time UpdraftPlus runs a backup — or fails to run a backup — it will email you the result. By default, UpdraftPlus sends the emails to your WordPress admin email address. If you want to change your admin address, choose Settings > General from the WordPress admin menu, then type your new address in the Email Address box and click Save Changes. Depending on your backup schedule, you’ll eventually receive an email telling you that UpdraftPlus has done a backup. But how do you know for sure that the backup really worked? The only way to be 100% sure a backup has worked is to try restoring your site from the backup. You probably don’t want to risk restoring a backup to your live site, though, in case the backup actually is broken! So the best bet is to set up a subdomain on your server and do a test-restore to that subdomain. The tricky thing about test-restoring your backup to a subdomain is that, after restoration, all the URLs in the restored WordPress database need to be changed from your live site’s domain (as stored in the backup) to your new subdomain. If you don’t do this critical step then the restored site won’t work. The easiest way to do this is to purchase the Migrator add-on (see Step 7 below). This automatically does a search-and-replace on your restored WordPress database, replacing all occurrences of the old domain with the new one. Use your hosting control panel (such as cPanel or Plesk) to create a subdomain and a separate MySQL database (and database user). If you’re not sure how to do this, ask me or your hosting company for help. Password-protect the subdomain site (because you don’t want to have two publicly-viewable copies of your live site). For example, in cPanel, click Directory Privacy in the Files section. Again, ask me or your hosting company if you get stuck! Install a fresh copy of WordPress on the new subdomain and database. Follow these steps to restore your UpdraftPlus backup to your new subdomain. Test everything works OK, and that all your content is there. Does test-restoring from your backup seem a bit scary? If so then an easier alternative is simply to inspect the backup files themselves to make sure they look OK. This isn’t as foolproof as doing an actual restore, but it does at least reassure you that your content is being backed up! Open the UpdraftPlus folder in your Dropbox. Open the Apps/UpdraftPlus folder in your Dropbox. This contains your site backup files. Copy the most recent backup files. 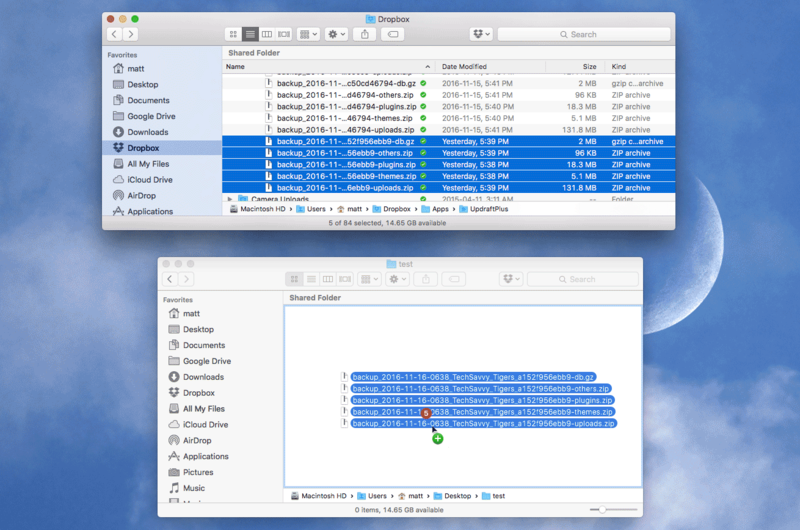 Copy the five most recent backup files to a test folder on your Desktop. Once you’ve unzipped the five backup files (top) inside your test folder, you’ll be left with a *-db text file and four folders (bottom). Check the contents of the folders. 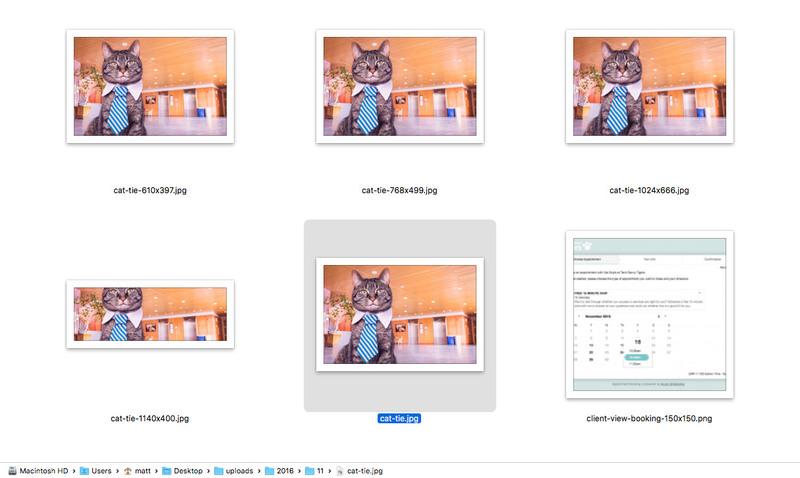 Here I’m checking the contents of my uploads folder to make sure all my uploaded media files are backed up. Check the contents of the database. 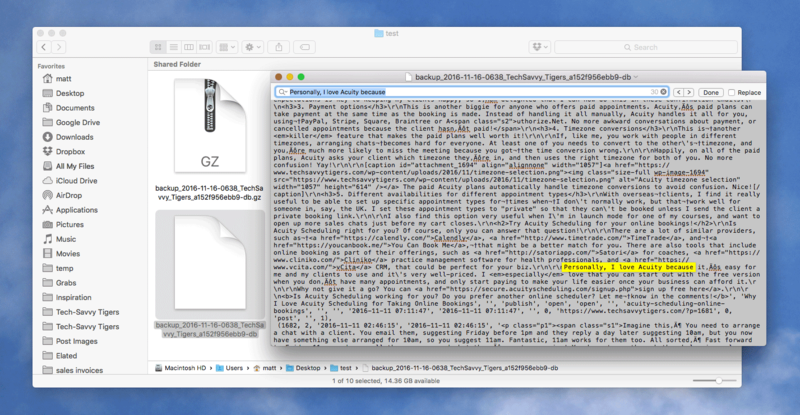 Here I’m searching the database backup for some text from a recent blog post to make sure the backup’s working. It’s worth test-restoring from your backups, or checking your backup contents, every couple of months to make sure they’re being backed up OK. Check the “last modified” dates on the backup files to make sure that your backups are recent. For extra reassurance, you might want to use another backup system at the same time as UpdraftPlus. If you have two different backups in place then you’re much more likely to have at least one working backup if you need to restore your site. For help with choosing another backup option, check out my WordPress backup guide. Migrator lets you clone a site to a different domain name. It automatically updates all the URLs in your WordPress database so that they use the new domain. Automatic Backups automatically backs up your site before you update WordPress, or any of your plugins or themes. So if an update breaks your site, you can quickly roll back to just before the update happened. Backup time and scheduling lets you set the exact time of day that backups occur. It also gives you more control over keeping backups to save space (for example, “keep all daily backups for a week, then keep only one backup per week after that”). More files backs up everything in your site. The free UpdrafPlus only backs up your database, plus your wp-content folder (which includes plugins, themes, your media uploads, and other files found in the folder). 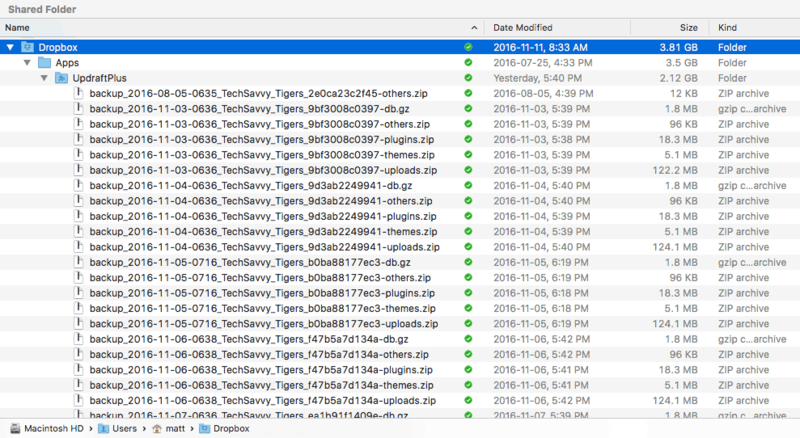 With More files, UpdrafPlus can also back up your WordPress core code, other files and folders outside your wp-content folder, and your wp-config.php file (which contains the basic settings for your WordPress site). Multiple storage destinations lets you send each backup to more than one destination. (It’s a good idea to have at least two backup destinations in case one fails.) When restoring or downloading a backup, if UpdraftPlus can’t reach a backup destination, it automatically tries the next one. Reporting gives you more detailed email reports of each backup. It also lets you choose which email address (or addresses) to send the backups to (the free version can only send to your WordPress admin email). More database options lets you encrypt your database backups; back up other non-WordPress tables inside your WordPress database; and back up non-WordPress databases. 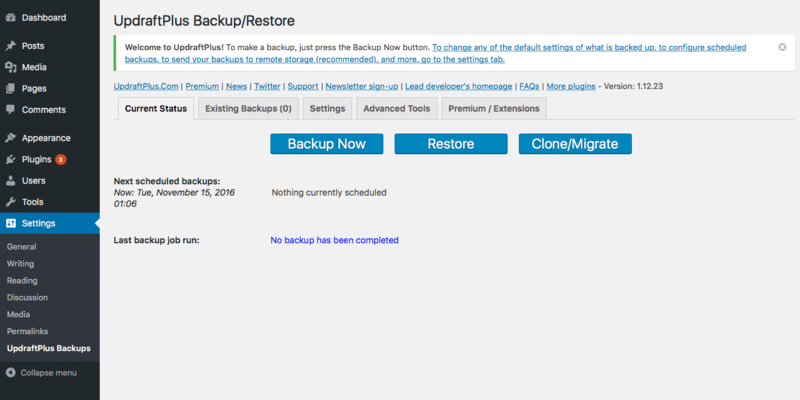 Importer imports backups made with other WordPress backup plugins — either ones that are no longer supported, or plugins that don’t have their own restore feature. Lock Settings lets you password-protect the UpdraftPlus settings page so that only you can access your backups or change UpdraftPlus settings. Good for managing client sites, or if there are multiple admins on your site. UpdraftVault is UpdraftPlus’s own cloud storage service. It’s really easy to use: once you’ve signed up, you just enter your UpdraftPlus account email address and password in the UpdraftPlus settings, then click the Connect button. You can choose from 5 GB, 15 GB, and 50 GB storage capacities. 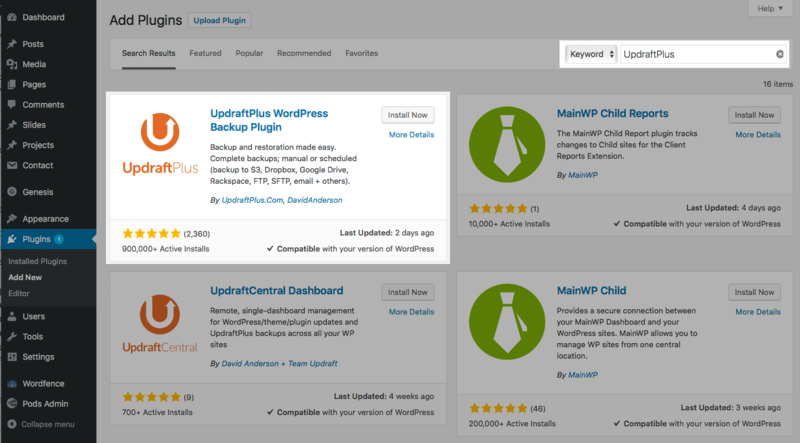 UpdraftCentral Cloud is a ManageWP-style remote web-based dashboard for managing multiple WordPress sites. 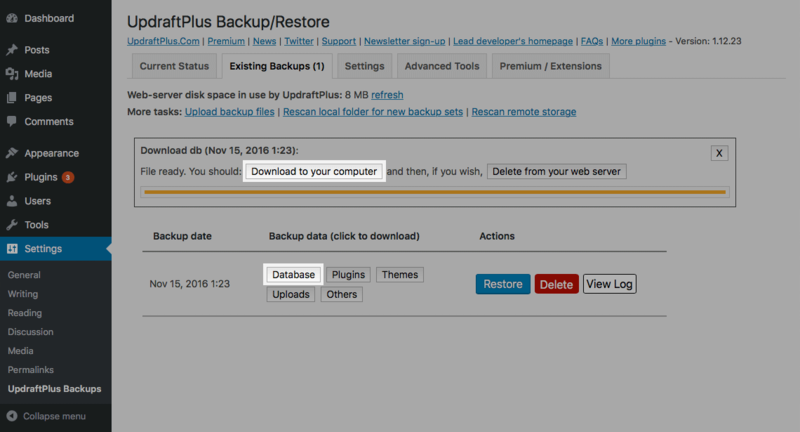 It lets you control the UpdraftPlus backups and settings on each site, as well as manage WordPress, plugin and theme updates. Support includes various support packages in case you get stuck, or have problems backing up or restoring. Always nice to know help’s available if you need it! Additional storage add-ons give you more options for remote storage, including Microsoft OneDrive, SFTP/FTPS/SCP (which let you securely transfer backups to your own server), WebDAV, Google Cloud Storage (not the same as Google Drive, which is included for free), and Microsoft Azure cloud storage. If you want to use more than one or two add-ons then your best bet is to purchase an UpdraftPlus Premium subscription, which includes all add-ons as well as free upgrades, free support, and 1 GB of UpdraftVault storage. Don’t you hate that sinking feeling when you visit your site and it’s broken? Open your Dropbox folder on your computer. Open the Apps folder, then open the UpdraftPlus folder inside it. 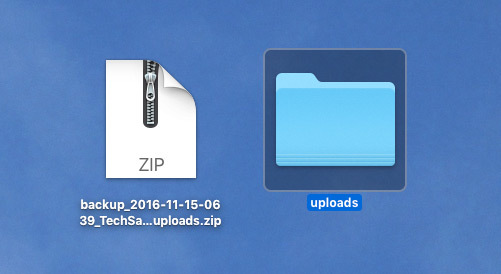 Find the Zip file in your Dropbox/Apps/UpdraftPlus folder that contains the file you want to restore, then copy the Zip file to your Desktop. Unzip the Zip file to a folder on your desktop. Find the file to restore. Find the missing file inside your unzipped folder. Re-upload the file to your site. Your web host accidentally deletes your site, and their backup doesn’t work. In this scenario, you’ll need to do a full restore of your site from your UpdraftPlus backup. If your site is so broken that you can’t even log into your WordPress admin, you’ll need to restore your site manually. This involves installing a fresh copy of WordPress; unzipping the UpdraftPlus .zip files and uploading the unzipped folders; and using your cPanel/Plesk and phpMyAdmin to restore your database. It’s not too hard to do, but you do need some technical know-how. Here are the instructions for a manual restore. Bring up the UpdraftPlus Existing Backups tab. 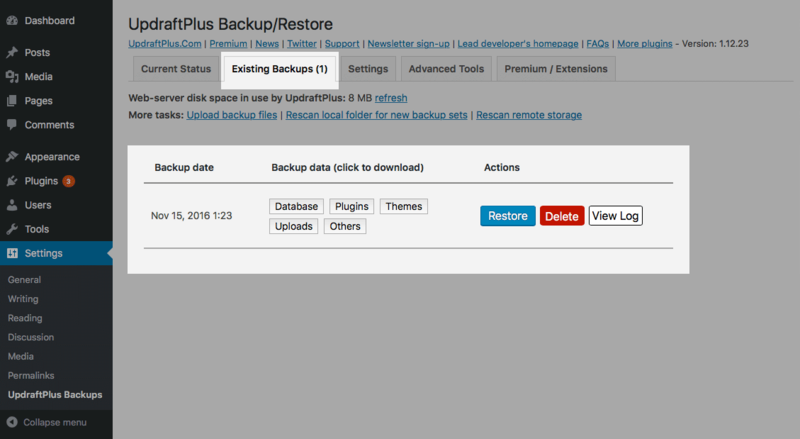 In the UpdraftPlus admin page, click the Existing Backups tab near the top. Click the appropriate Restore button. Click the Restore button next to the backup you want to restore. Select everything you want to restore, then click the Restore button. Once the backup files have been processed, click Restore again to begin the restore. 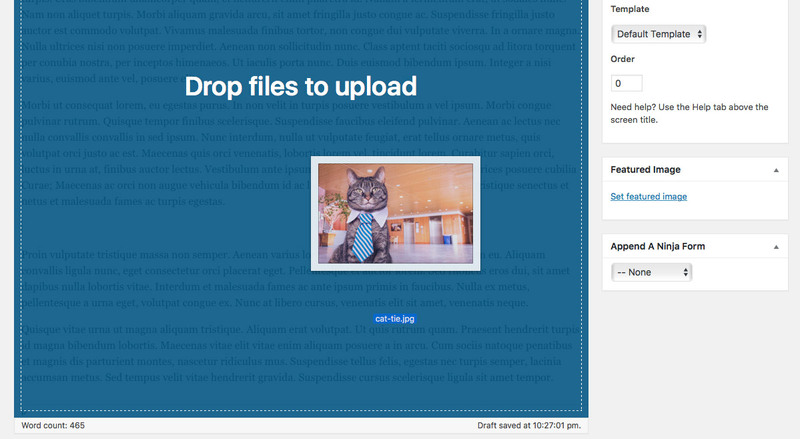 After a while, you’ll see messages appear as UpdraftPlus restores your site. If all goes well, the message Restore successful! appears at the bottom of the page. Move your mouse over your site name in the top admin bar, then click Visit Site. Make sure your site looks OK, and contains all your posts, pages, and comments. Click the Visit Site link and make sure the public-facing side of your site all works OK.
Again, move your mouse over your site name in the top bar, then click Dashboard to return to your WordPress admin. Choose Posts in the left-hand admin bar and make sure all your posts are there. Repeat for the Media, Pages and Comments menu items. You might also want to check your widgets are intact (Appearance > Widgets), and that your plugins (Plugins >Installed Plugins) and themes (Appearance > Themes) are there. Finally, of course, you should make sure that your UpdraftPlus settings are intact, and that backups are still scheduled (Settings > UpdraftPlus Backups, then click the Settings tab). If you’re happy that your site has been restored perfectly, go ahead and delete the old directories in the UpdraftPlus admin. Keep your WordPress site safe with UpdraftPlus! If you’ve read this far, you’re an UpdraftPlus expert! You know how UpdraftPlus works, how you can use it to make regular backups to your Dropbox, how to make sure your backups are working, and how to restore your backups in an emergency. So go ahead and install UpdraftPlus, and start protecting your site today! Remember to check your backups regularly, and install another backup option for extra security. Oh, and to keep your site as secure as possible, make sure you download our WordPress Security Checklist and work through the eight steps to protect your site. Do you have any questions about UpdraftPlus, or are you having problems backing up or restoring? Feel free to ask me for help in the comments below! Really good article on UpdraftPlus. Thanks. I have recently installed it on a website without problems, but I get the white space message once the backup has been made. Having read a few blogs on it I tried deactivating plug-ins etc..but to no avail. I am not familiar or confident enough with php to tackle this. Thank you for this great article! Unfortunately, I couldn’t get through step 3. When I clicked the link to connect UpdraftPlus to my Dropbox account, I got a blank white screen. When I went back later to try again, that link was gone. According to the UpdraftPlus website, it should still be there for “re-authenticating” but it isn’t. I tried uninstalling and reinstalling the plug-in, but it saved my settings, so that didn’t work. I can’t click the “wipe settings” button because that is also missing (from the expert settings area). Any idea how I can connect to my Dropbox account without paying for UpdraftPremium? Thank you! The “wipe settings” option isn’t actually under Expert Settings. 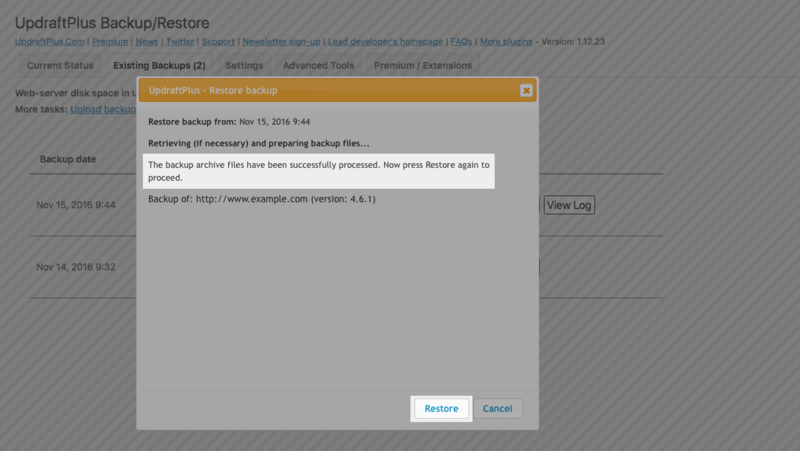 To get to it, choose Settings > UpdraftPlus Backups, then click the “Advanced Tools” tab. You’ll see “Wipe settings” in the list on the left. Click it, then click the “Wipe settings” button. If you still have issues, then it could be a problem with your browser. Try a different browser — for example, if you normally use Chrome then try Firefox. If it works in the new browser then try disabling all the extensions/add-ons in your normal browser, as well as clearing your browser’s cache and cookies. 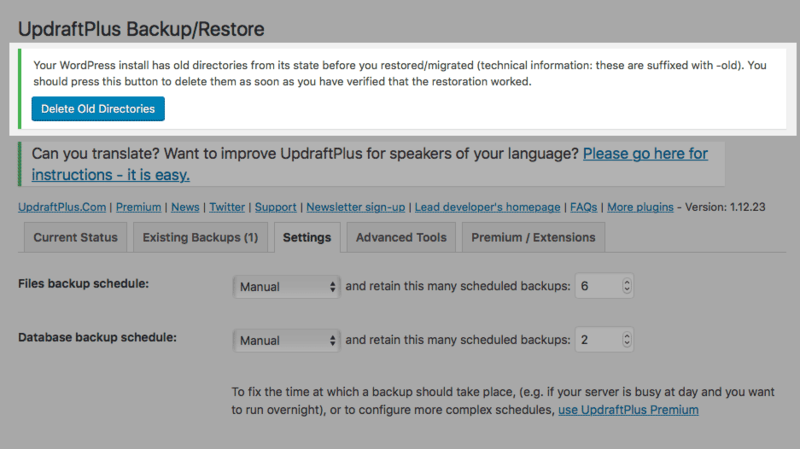 Can you only have the two back up selections to restore from (from inside of the WordPress/Updraft panel)? Can I have three? If I save a third will it delete one of the older ones (I don’t mean having more than one copy on my FTP or exported files for manual installs, but directly from inside of the WordPress dashboard)? I have two in there, I don’t want to delete them, I want to keep them there, save a third backup and then restore to my second one. If the second one doesn’t work out I want to be able to restore to the third one/the backup I had just created. But I haven’t seen any pictures of anyone having more than two. I am actually just wanting to replace my rev slider plugin with an older version. Somehow they got corrupt on my server and then my host deleted them. There was a brand new one put on (but not edited) – I want to go back to before the plugin was deleted. Should I delete the new one or leave it before doing an plugin recovery? Also a separate issue sometimes I get a FTP login error in the pop up window in the second to last step when restoring. You can create as many backups as you like, as far as I’m aware. Certainly much more than two. What is the exact FTP login error you’re seeing? It may be that you need to re-enter your FTP login details, or that there is an issue with the FTP connection (such as a firewall issue or an unsupported FTP protocol). Great article! I miss some information though on the security of the backups in case of your wordpress site getting hacked. How do I prevent hackers who have gained admin access to my site from deleting or overwriting the backups stored in Dropbox? This can be done from the plugin. I know I can manually copy the backups to different other computers, but I’m looking for a secure automatic solution.